Two decades after being imprisoned for insider trading, Gordon Gekko (Michael Douglas) is set free, profiting on his infamy as an author and public speaker. 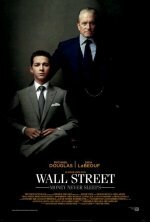 At a time when the market is crumbling and those working on Wall Street are scrambling to cat... show all ch a break, Gekko is approached by Jacob (Shia LaBeouf), a young trader looking for Gekko’s guidance. Fox is bumping Oliver Stone's Wall Street sequel to the fall. "Wall Street: Money Never Sleeps" will be released on Sept. 24 instead of April 23 as previously planned. Michael Douglas reprises his role from the franchise original, with Shia LaBeouf co-starring in the sequel. Orlando Bloom is toplining "The Good Doctor," an indie drama to which Michael Pena, Troy Garity, Courtney Ford, Taraji P. Henson, Rob Morrow and J.K. Simmons are in negotiations to co-star. changed the title from "Wall Street 2: Money Never Sleeps" to "Wall Street: Money Never Sleeps"